The Cave of Amarnath, lying at an height of 3952 Mtrs. is a famous holy place of pilgrimage for the Hindus and is held in the same veneration as Mount Kailash in Tibet. The sacred Cave contains a Shiva Lingam formed of Ice, the size of which increases or decreases according to the position of the Moon. Usually there is a big Festival in the 3rd week of August every year thousands of people from all over the country and from different parts of the world visit this Cave. The difficulty of the pilgrimage continues in itself, an extra ordinary sacrifice. Leave Srinagar by cars/coach 93 Kms three hours drive to Pahalgam (2440 Mtrs) enroute visit Saffron fields, Avantipur ruins and mattan Temple. On the way see some beautiful villages. Pahalgam is the most famous place for Indian Film Industry. Enjoy the nature charm of the valley. Overnight at Hotel. Leave after early breakfast from Pahalgam to Chandanwani by cars immediately start trekking ascending towards Sheshnagh which is 12 Kms trek. steep ascending towards Pishoo Ghati pass 13000 Fts. Overnight in Tents. Start after breakfast steep ascent towards Amarnath Holy Cave where you can see ICE LINGAM. This is the holy cave for Hindus and thousands of people visit the place during full Moon day. From Amarnath steep descend towards Baltal 3/4 hrs walk. Overnight in Tents. From Baltal it is 15 Kms drive to Sonamrg. Sonmarg (2690 Mtrs) which is the most beautiful spot of Kashmir valley. 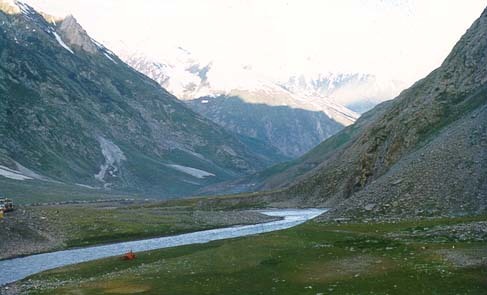 Sonmarg is known as Gateway of Ladakh. Continue drive to Srinagar which takes 3 Hrs from Sonmarg.